Flash Reading App for Windows 8 lets you increase the pace at which you can read paragraphs. If you are someone who finds it difficult to read typed text in speed or if you aim at taking your reading abilities to next level then consider giving it a try. What we don’t realize is that reading at slow pace consumes a lot of time which might be otherwise be used for something creative. Flash Reading lets you practice speed-reading in a highly convenient manner and can prove quite helpful. 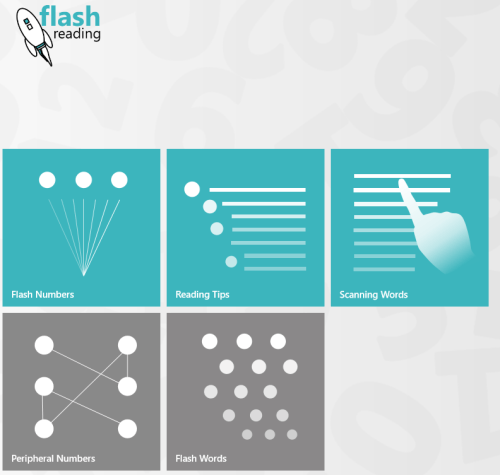 On launching this Flash Reading app for Windows 8, you will be shown following interface with four different sorts of practices. Each one has been discussed properly in the section beneath. Flash Numbers: Here you are practice in attempt to improve you ability about memorizing the numbers. You are shown a number for one second and then your task will be to type the same number in the textbox. The cog-wheel icon in the right can be utilized to increase decrease number of digits. 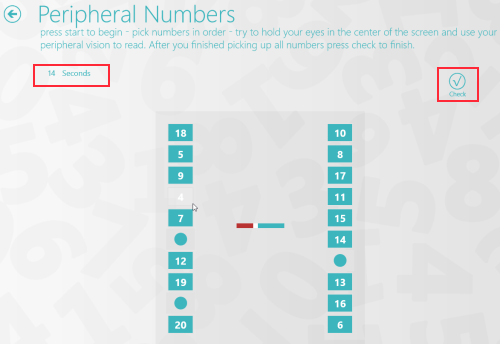 Reading Tips: This is nothing,but simple explanation about Flash Reading App for Windows 8. Scanning Words: This is another interesting game that aims at increasing your reading abilities. Here, you require pasting a paragraph and click on start button. Then, a word will be presented to you and your task will be to find it in paragraph (or Paragraphs). This game is more about skipping & skimming the text. Peripheral Numbers: This is an interesting game where your task is to tap randomly placed numbers from 1 to 20 in ascending order. The idea behind the service is to improve your peripheral vision. More quickly you accomplish the task better will be the result. 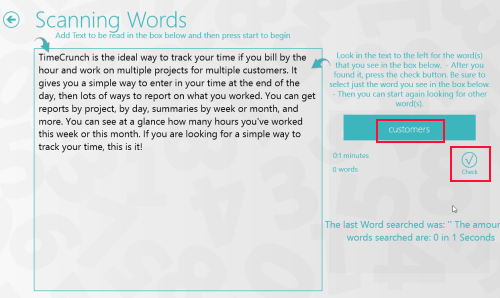 Flash Words: It allows you to play paragraphs at particular WPM (Words per minute). Your task will be to read the words being played. * This app is for self-evaluation and improvement. Do not try to cheat as that won’t help anyone. Also, check out our posts on Language Translator Apps, Encyclopedia Apps, and eBook Apps. Flash Reading App For Windows 8 can be easily located for free under ‘Productivity’ section of Store. It sizes only 539 kb and installs within seconds. You can install Flash Reading App For Windows 8 by opening this link in Internet Explorer 10 or later. Then click on ‘ View in Windows Store’ button followed by a click on install button. Flash Reading App For Windows 8 is definitely the stuff to try. I admire its simplicity as well as its approach.